So You Don't Think Your A "Cat Person"? Consider a Ragdoll! So you don’t think you are a cat person…cats can be antisocial, aloof and nocturnal creatures. However, there are breeds that will welcome (and even crave) your attention. Some you can even train to play games with you. One such breed is the Ragdoll. 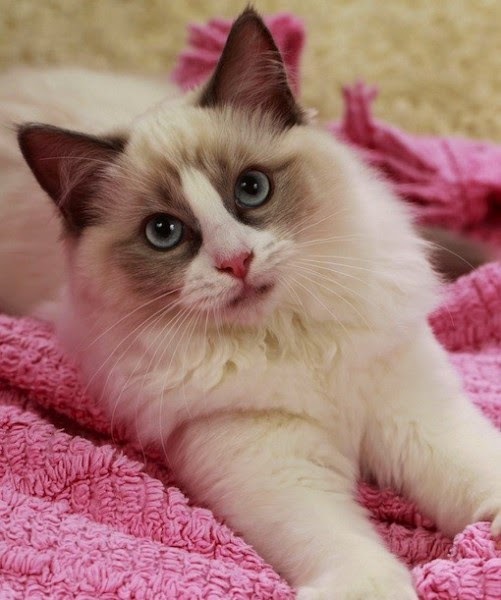 They are considered very lovable, easy going, social cats and as their name suggest, they become like a ragdoll when picked up or given attention. They are known to meet you at the door and will be your shadow as they follow you around the house and lucky you, they will keep their kitten like demeanor throughout their life. They are a large breed, with males reaching up to 20 pounds and females about 15 pounds (at full maturity- by age 4). The life expectancy for a Ragdoll is between 12-15 years. Your ragdoll will require some grooming, but it's a small price to pay for the love and attention they bring. Ragdolls generally do not have many health issues, but can be predisposed to bladder stones and hypertrophic cardiomyopathy (HCM) a heart condition where there is regional or diffused thickening of the ventricle wall. For Bladder stones: Stones (and Urinary Tract Infections that may accompany them) we have found the combination of Renelix, Kidney Health, Quentans and Pet UTI Prevention Formula + Power Probiotic to help. When considering a new addition to your furry family, take a look at a Ragdoll. Their personality and adaptability might be a perfect fit for your busy life style.